WSOC continued to air inaccurate reports filled with transphobia, even after extensive conversations and concerns aired by LGBT community members and leaders. Was the station intentionally misinforming the public and intentionally stirring anti-LGBT and transphobic sentiment? Catch the updates and full post below, then voice your concerns to WSOC regarding their biased, inaccurate, incomplete and transphobic report by calling news director Julie Szulczewski or executive producer Randy Wardell at the news room at 704-335-4871 or through their main switchboard at 704-338-9999. 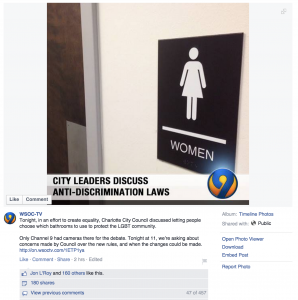 UPDATE (Feb. 10, 5:33 p.m.) — WSOC aired a slightly re-worked news story on last night’s debate regarding LGBT-inclusive ordinance protections under consideration in Charlotte. The station had come under increasing scrutiny from LGBT community members and leaders following their extreme inaccuracies, biases and offenses in their coverage on Monday evening. The full post below contains a rundown of the concerns from the Feb. 9 coverage. Tuesday’s 5 p.m. news report, which aired shortly before 5:20 p.m., attempted to strike a better balance, with WSOC including a more comprehensive report on the full suite of ordinances under debate. Notably, WSOC continued their inaccuracies and failed to correct their inaccuracies from Monday evening, breaking nearly every journalistic obligation and ethic. UPDATE (Feb. 10, 12:33 p.m.) — Even after this lengthy response and concerns, and after similar concerns have been addressed with them directly by several LGBT community leaders, WSOC continues to misrepresent and skew their coverage, providing an inaccurate view of the proposals being debated in Charlotte. As noted several times with WSOC and in the commentary below, this proposal is NOT about creating unisex or genderless restrooms. WSOC’s repeated inaccuracies are increasingly becoming intentional. Want to take action? 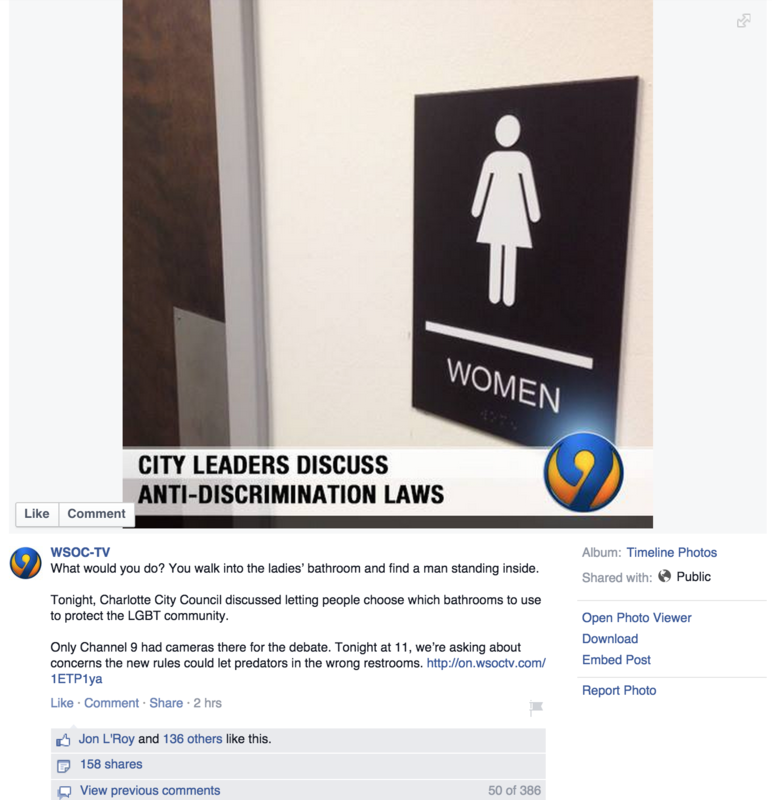 Be sure to read the commentary below, then voice your concerns to WSOC regarding their biased, inaccurate, incomplete and transphobic report by calling news director Julie Szulczewski or executive producer Randy Wardell at the news room at 704-335-4871 or through their main switchboard at 704-338-9999. The new ordinances include changes to a suite of four ordinances, adding five new characteristics — marital status, familial status, sexual orientation, gender expression, and gender identity — to enumerated lists of already protected classes currently included in four city ordinances: the public accommodations, Commercial Non-Discrimination, Passenger Vehicle for Hire and Community Relations Committee ordinances. Instead, viewers were treated to unbalanced, incomplete, inaccurate and heavily biased commentary against transgender people — complete with a call to action at the end for citizens telling them they can “sign up to speak and voice your opinion on the proposal” at Council’s next meeting in two weeks. But those relying on WSOC for information about the ordinance changes wont’ have a very informed opinion. And WSOC had plenty of warning they were headed in the wrong direction — from the staffer of a local LGBT organization early in the day on Thursday and criticism from community leaders, including myself, in response to their horribly transphobic Facebook post promoting their 11 p.m. newscast. The station ignored them all. That was the caption originally posted by WSOC on its Facebook page to promote its evening newscast. After phone calls from me and several other community members and leaders across the state, WSOC relented and edited their Facebook post. Two screenshots below; click to enlarge. But it was while I was on the phone with WSOC’s executive producer Randy Wardell that it became apparent the station had little, if any clue, why their online promotion was so outrageously offensive, biased and dangerous. Wardell claimed the station was simply expressing the main concerns as they emanated from the night’s main point of debate. He said they were being “right down the middle.” He disagreed with my assertion that the post (a) ignores completely the reality of who transgender people are and (b) insinuates, though slightly, that transgender women, in particular, are merely men in dresses using the women’s restroom (one of the most common stereotypes). And, the post unfairly accomplished several other things: portraying transgender people as potential predators and completely, utterly ignoring the reality of what was truly under debate by City Council, a mistake they repeated when they aired their newscast. I’d spoken to Wardell before I had the opportunity to watch their 11 p.m. newscast. He urged me to watch it, again stressing they would be fair and balanced. I told him I’d like to believe him, but everything I’d seen and heard so far told me their report would be just as biased as their interview attempts and Facebook post earlier in the day. Like the Facebook post, the newscast also painted transgender people as predators, failed to accurately describe what was truly under debate by City Council and gave far more air time to opponents than proponents, while also leaving out key context surrounding the comments they did air. There’s nothing in the suite of ordinances that changes current practice regarding “choice” of bathroom. currently, all people already self-identify and self-select which bathroom they will use. Bryant’s summary of the changes also suggests similar prejudices found in the station’s Facebook post — namely, that a transgender man isn’t really a man or a transgender woman isn’t really a woman. As the report by Jenna Deery opens up, the station again repeats an inaccurate reading of the changes under debate. “Signs posted tell us what restroom is designated for what gender, but the Human Rights Campaign is advocating for the right to choose and not to be discriminated against,” Deery says. I was at the meeting. Sat through the full hour of debate. What was clear to me is obviously not clear to Deery or WSOC. NO, the Human Rights Campaign is NOT advocating that men be able to use women’s restrooms or vice versa. And, again, the station seems absolutely unaware that the public accommodations ordinance is inclusive of far more facilities than just bathroom sand that this is not a “bathroom bill.” In fact, the station quotes from an ordinance that will actually be stricken from the city code, and fails to mention other places, like restaurants, where discrimination based on the entire enumerated list of characteristics will be banned. Instead, the station just simply chose to present an incomplete picture of the entire suite of ordinances under discussion, instead focusing on bathrooms only. The station also inaccurately tells viewers this is the first time Council has discussed the suite of proposals. This is not true. Council first discussed this changes, also with depth, in November. Also worth noting: Nearly every time the station shows a single restroom sign, they’ve chosen to focus on a women’s sign. (A men’s sign appears only once.) It’s a shameful play in bias against transgender women and serves only to gin up more fear among those who are, even sometimes violently, willing to “defend” their children and wives against people who aren’t really a threat. The station’s newscast quoted five people in the story, giving nearly double the amount of air time to opponents than they gave proponents. They also failed to quote even a single Council member in favor of the change, while also completely leaving out any comment from one of the Council’s two openly LGBT members, including one who spoke about his own experiences dealing with anti-LGBT discrimination. That’s a total of only approximately 12 seconds for proponents and approximately 23 seconds, nearly double, for opponents. Of the people the station did quote, they failed to capture the full context of their comments and any important responses to them during debate. If people who are transgender are forced to use the restroom not consistent with their gender identity. If [a transgender woman, for example] is forced to use a men’s restroom, the situation you described first — that they will see someone who presents, looks, like, identifies as a woman in a men’s restroom. … [This ordinance] is actually fixing that concern, not causing it. WSOC’s focus on potential “predators” is understandable, perhaps, given the level of debate from opponents on Council. However, it would seem to me, if the station is concerned, that they would include important facts about abuse or harassment in bathrooms — like the fact that no documented evidence exists of any act of abuse or harassment by a transgender person, despite reams of evidence of abuse, violence and harassment directed toward transgender people. But the entire thrust of the conversation from WSOC painted a picture of potential violence toward cisgender people by transgender people accessing restrooms. All evidence shows: Trans people aren’t the perpetrators here, they are the victims. And for a station so concerned with safety and predation, it seems curious to me they’d fail to adequately identify Flip Benham, one of Charlotte’s most widely recognizable anti-LGBT and anti-choice activists and the only one they quoted to have actually been convicted of a potentially violent crime — convicted in 2011 for stalking an abortion doctor. WSOC could have prevented this train wreck of sensationalism and bias. If only they had listened. The station had multiple opportunities on Monday to stop, listen, ask questions and think about the direction of their reporting. They chose not to each and every time. The first time, I’m told, is when Rodney Tucker, executive director of Time Out Youth Center, declined to give WSOC an interview because of their overly biased questions. That occurred mid-afternoon on Monday, long before the station was due to attend the Council meeting and later air their report. Tucker tells me he tried to get the interviewer to ask more informed, appropriate questions, but he declined. Tucker also later communicated with another WSOC staffer, suggesting more nuanced and appropriate questions. He didn’t receive a response. The second time was the Council meeting itself. It’s clear WSOC and its staff had a preconceived notion of the debate and chose only to hear, and later only to air, those comments and views which matched their pre-written narrative. The third time was when WSOC spoke to Scott Bishop. Knowing the previously aired concerns from Tucker, and having suggestions for more nuanced questions, Jenna Deery could have actually taken the time to hear and later air some of that nuance from Bishop. The fourth time was the criticism the station received via phone late in the evening from multiple community members and leaders, both from local organizations and statewide organizations, including myself, after their outrageously offensive and biased Facebook post. All of these opportunities provided space for WSOC to learn and to listen, to change the direction of their story and present a fairer, more accurate, more complete story. They refused. Each. And. Every. Time. This isn’t the first time WSOC has maligned or otherwise improperly biased a story against the LGBT community. Last time, there was little outrage or feedback outside of my own commentary. This time will be different. It’s already been different, as the station’s heard from multiple leaders regarding their story. Every local and state LGBT leader I’ve spoken to agrees this is the absolute worst reporting they’ve seen on these issues thus far. Apologize for and retract the Facebook post in its entirety. Apologize for and retract the newscast. Re-air a more properly nuanced and balanced, fully accurate and fully complete news report that properly informs readers. Schedule a meeting with LGBT leaders and community members, particularly inclusive of transgender people, to hear concerns and gather feedback and learn more about who transgender people are. Have news reporters, anchors, producers and others in charge of story narratives participate in an LGBT sensitivity/awareness program, especially one heavy on nuance and awareness regarding transgender people. Without taking these steps, WSOC will be unable to make up for the extreme damage and harm their reporting caused the community on Monday night — particularly their inspiration of violence and hatred against an already much-maligned and dangerously victimized minority of transgender people. Take responsibility for the accuracy of their work. Verify information before releasing it. Do you want to take action? Voice your concerns to WSOC regarding their biased, inaccurate, incomplete and transphobic report by calling news director Julie Szulczewski or executive producer Randy Wardell at the WSOC news room at 704-335-4871 or through their main switchboard at 704-338-9999. The bathroom meme is a red herring used by opponents of Trans people specifically to create fear and hysteria with the ultimate goal to deny Trans people of basic civil rights. All one needs to do is to examine the multitude of cities, counties, businesses, and other institutions that to allow Trans people to use the restroom that conforms to the gender presentation to see that there is no problem. There are no cases of men going into women’s restrooms or Trans sexual predators or peeping toms. It’s absolutely ludicrous. Secondly, there are laws already on the books that protect people from lewd or sexual harassment or sexual predatory behavior. To assume that adult men are going to go to the trouble of dressing like a woman to be able to enter the ladies room to get their kicks just doesn’t hold up to reality. Unless the public want to go to the expense of tax payers footing the bill to build gender neutral restrooms in every public building, I suggest they deal with this by going into a private stall, locking the door, and doing their business. What you have found out is that WSOC is much like Fox News. Their broadcasts on the council meeting was done intentionally. They won’t apologise and they won’t change their position. They are not about reporting news but slanting news just like Fox News. Since the courts have rule that news broadcasts are merely entertainment, they are free to do such antics with impunity.